We service and install any and all, rebuilt Sterling truck differentials. Rebuilt Sterling truck differential offered worldwide. We can deliver your rebuilt Sterling differential by tomorrow. We also ship worldwide. We offer rebuilt Sterling differentials and truck parts. The Sterling axle was developed to replace the Dana 60 and Dana 70. 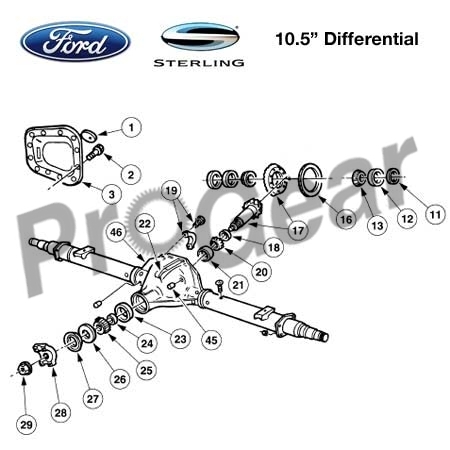 The Sterling 10.5 axle is currently only made as a full floating axle. Thousands of rebuilt Sterling truck differentials in stock ready to ship today. We are your one stop rebuilt Sterling truck differential shop. Ring gear measures 10.5 inches (270 mm). Ratios 3.08 to 4.30. Current production ratios offered are 3.31, 3.55, 3.73, and 4.30..
2005 through 2012 have 13.38 in (340 mm) disk brakes, dual piston calipers and 8.1 in (210 mm) in hat parking brakes. 2013 have 14.29 in (363 mm) disk brakes, dual piston calipers and 9 in (230 mm) in hat parking brakes.